If you smell a musty odor or see mold spores in your home, it’s time to take action. 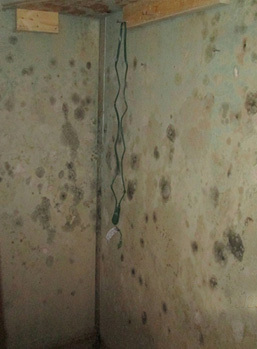 While some mold is unavoidable, an overgrowth of mold can lead to serious issues. Health problems like asthma, recurring sinus infections, and other illnesses can be brought on by mold exposure. Left untreated, mold can be a dangerous air pollutant that spreads quickly to other areas of your home. To find out if you need professional remediation of your mold issue call DRYmedic.® We’ll provide an in-depth mold inspection, and in some cases, recommend an air quality test before we recommend a solution. DRYmedic® is certified through IICRC and NAMP to provide professional mold remediation and removal services. Mold spores can spread quickly and easily during the mold removal process. It’s imperative to hire a professional mold remediation team to contain the area, remove the mold and mold infested materials, clean the area and contents, and restore your home. The DRYmedic® team always follows the necessary precautions for treating mold safely and effectively. If you think you might have a mold problem, call DRYmedic. A quick assessment will put your mind at ease. Improper cleanup of water damage is one of the leading causes of mold overgrowth. If you’ve experienced a basement flood, sewer backup, appliance failure, call DRYmedic. Our expert water extraction team will do a complete dry out and cleanup before mold takes over.